Do you know what to look for when buying Opal Jewelry? The rainbow of colors in opal jewelry is magical. 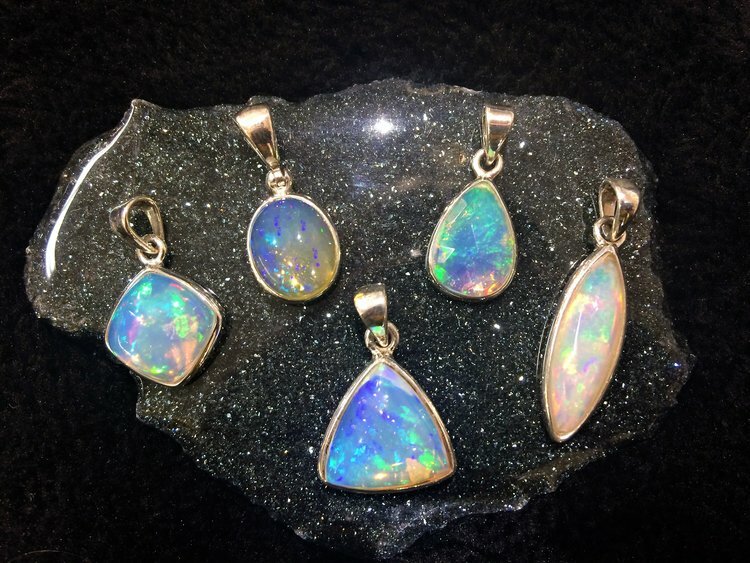 What makes opals so unique is that every single stone is one-of-a-kind in its pattern and colors. So how do you decide which piece of opal jewelry is the right one for you? Keep reading to find out what to look for when buying opals. With this article, we are going to get a little technical because there is a great variety of opals. Don’t worry, we’ll take it one aspect at a time. Read further to find out how to buy semi precious stones. Let’s start with the most basic question, what kind of stone is opal? Opal is a semi-precious stone formed by evaporated rain from inside rock crevasses. The mineral element is silica. Silica is able to reflect light which gives opal its distinctive quality. Different from other gemstones, opal can be a wide variety of colors. The appearance of opal will even change depending on the light and angle. To make classification somewhat easier, the body color of opal is what determines its value. Trust us, it’s hard. Even determining the body color takes some skill. The play of color refers to how the opal is able to reflect the light. The more the color changes as you move around, the more valuable the gemstone. When buying opal jewelry online, it will be hard to determine the play of color. The clearest depiction will be through a video where the seller moves the opal in different angles. 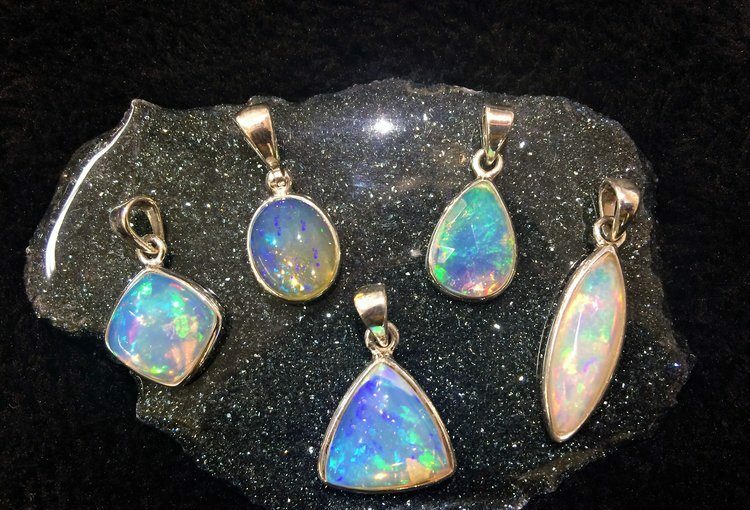 The body color is the base color of an opal. It can be hard to see the body color when it comes to opal jewelry. The best way is to lay down the opal on a flat surface and look from directly above. Generally, the darker the base color, the more valuable the stone because it better showcases the reflective colors. There is a scale for body color in opals. The scale goes from N1 being the most valuable to N9 being the least valuable. An opal with a black body color (N1) is rare and, as such, the most valuable. At the other end of the spectrum, you have opals with a milky white body color. Opals can also have bright body colors like red, blue, yellow and orange. This one is quite simple. How transparent is the gemstone? Opals will be more valuable if they are more transparent. There are three classifications for an opal’s transparency. The least valuable is an opaque opal where you can’t see through the stone. The next category consists of translucent opal jewelry which allows some light to pass through. The most expensive opal is the transparent opal which means, you guessed it, that you can see through the stone. Check your opal jewelry for transparency by holding it against light and looking through the stone. How clear can you see the objects on the other side? This is one of the simpler checks. No, we are not talking about twins. Opals are brittle stones so when used in jewelry the stones will need a protective layer to stay durable. The techniques to protect opals are called a doublet and a triplet. Giving opals a backing layer in a different material is called a doublet. The doublet layer can be the natural rough rock that the opal comes from. Usually, this layer is either glass or obsidian. The benefit of a doublet is that the colors of the opal will be brighter because of the darker background. If you are buying opal jewelry, however, you can only tell whether there is a doublet by removing the stone. It’s easier to just ask your jeweler. A triplet has an additional protective layer over the opal. Essentially, there will be three layers, a backing (doublet), the opal itself and a clear cover like glass, plastic or crystal. We recommend that you get a triplet to protect your opal. After all, your opal jewelry piece is one-of-a-kind and irreplaceable. You want to keep it safe from the elements. Sometimes opals will have a natural fault in them called an inclusion. An inclusion is a line inside the rock that forms against the grain. This is different from a crack in the stone. You can check for inclusions by holding the opal against the light with a microscope. Knowing all these characteristics means you are ready to go shopping for opal jewelry. Opal is a precious stone so consider buying opal jewelry in a precious metal setting too. Want to know more about gemstones in jewelry? Read through our other articles on semi precious and precious stones. If you want to see Ana Luisa’s unique gemstone jewelry collections, visit our online jewelry shop.